JNTUK 2-2 Supply Results 2018: JNTUK B.Tech 2-2 Semester R16, R13, R10 Supply results Nov 2018 declared at jntukresults.edu.in. Students can check jntuk 2-2 R16 Results, JNTU Kakinada R13, R10 results from Working links given below. JNTU Kakinada University, In the month of April conducted the JNTUK B.Tech 2-2 Semester R16, R13, R10 Supplementary examination for the year 2018. A huge amount of candidates have applied for the examination and are now eagerly waiting for the JNTUK 2-2 results. Scroll down, where we have provided further details in this regarding and also will include the official links to check jntuk b.tech 2-2 results 2018 once it’s available on the official results portal. Jntu kakinada University has successfully Conducted JNTUK B.Tech 2-2 Supply Exams in the month of November 2018. The students who wrote the Supply examinations (R16, R13, R10 Regulation) in the month of November 2018 can now check the results online. The university on the other hand has provide the official links very soon. The students can go on the listed links and see the entire results or can contact the college’s staff and know the details. 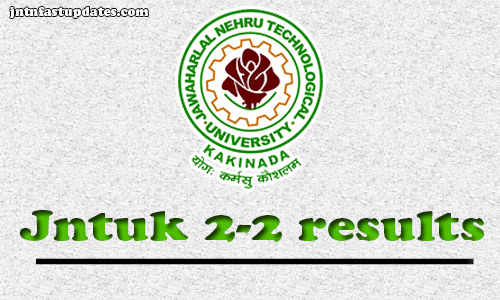 Jawaharlal Nehru Technological University, Kakinada (JNTU) has released the results for the JNTUK 2-2 Results 2018 examinations. The students can log on to the official website jntukresults.edu.in to check the result. Jawarlal Nehru Technological University Kakinada is one of the biggest Technical Education Universities in India. Annually the JNTUK conducts semester examinations twice in a year. Students pursuing under JNTUK will attempt their academic examinations in September/October and March/April months. JNTUK also releases the results of corresponding examinations within 4 or 5 weeks after the completion. Students those have appeared for their Semester examinations can keep checking the JNTUK Official website, jntukresults.edu.in on regular basis to check the result date. Apart from this, the students who feel unsatisfied with their scored in first semester results can further go for the revaluation or recounting on or before specified date, through online only. The further evaluation of the papers has been completed and the students have been waiting for more than 40+ days and are still waiting. However, the jntuk 2-2 R16, R13, R10 results are declared on 19th January (Saturday). JNTU Kakinada 2-2 R16, R13, R10 Results Date? JNTU Kakinada University has released official notification regarding result. So Students get ready with their hall ticket number to know their respective JNTUK 2-2 Result 2018 from below. LLast Date for Applying Recounting/Revaluation/Challenge By Revaluation: 30-01-2019. The process of checking the JNTUK II year II sem results 2018 is completed and it makes the students easy also and then further decides to go for the revaluation or recounting process if unsatisfied with the results. A time of almost 1 week is gives for the students. This is the turning point for the students and they can further decide with the process. How to check the JNTUK 2-2 results 2018 at jntukresults.edu.in? On the home page, click on the link “JNTUK 2-2 Results Nov2018”. jntuk 2-2 results, jntu kakinda 2-2 results, jntuk 2-2 r16 results. The students should also consult the college staffs for more details and information and they will guide you with the next step. The First semester of JNTUK B.Tech 2018 is said to be conducted from December and the results of the same are expected to release in February 2018. The students can all start preparing themselves and do their best to score good marks and go with the further decision about their education. The percentage of the students also plays an important role for the students and the competition also is huge as huge amount of students were seeing appearing for the examination. Hence, to conclude we hope we are clear enough with the dates and schedules. Don’t forget to share the info among all your friends and also on your social media pages. Feel free to get in touch if you have any doubt in this regard. Follow Our Official Facebook Page. About JNTUK : The Jawaharlal Nehru technological University, Kakinada, JNTUK is public university and is located at the Pithapuram Road in Kakinada. The college offers various programs for the interested students every year so that they can choose to brighten up their future in the interested subjects. It is important to provide a guiding stone for the students in order to allow them choose their future and make the nation proud. The government these days is also very much interested and is taking steps to improve the education system all over the nation. 1.3 How to check the JNTUK 2-2 results 2018 at jntukresults.edu.in?